RODA is an acronym for Roditelji u akciji, or Parents in Action. RODA is also a play on words since it is the Croatian word for stork and its first three letters, “rod” are the first syllable of the Croatian words for parent and birth. Roda’s vision is a society that actively works to fulfil the needs of and protect the availability of the rights of children, parents, future parents and families as a whole, including the right to ever person having an individual informed choice. Roda’s mission is to change society into a society that acts responsibly towards children, parents, future parents and families – through information, education, active lobbying and inclusion in the processes of change, as well as encouraging parents and other societal groups to question the status quo and be part of change. Respecting basic human and children’s rights as well as the dignity and value of all persons. Respect, openness and tolerance for all diverse differences among individuals. In our activities we promote the value of volunteerism as a form of civil inclusion in societal processes that strengthens individuals, builds a feeling of solidarity and encourages action. We believe that all information and knowledge must be available and free for all end-users and as a result our activities and educational materials are never sold with the intent to make a profit, instead this is done only in exceptional circumstances when this is the only way that they can be available. In our work and activities we respect the principles of environmental protection and sustainability. 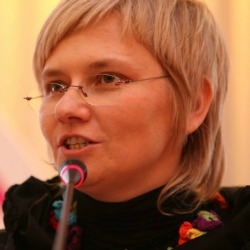 Ivana Zanze is Executive Director of RODA.